A Valentine’s Day-and-beyond pick for the eternal romantic! Continuing the success of crafting understated and beautifully feminine fragrances, philosophy, the well-being beauty brand, is proud to unveil a new addition to its spirited collection. Introducing loveswept, a sparkling fragrance that uplifts the senses and inspires the emotion that love is where it all begins—love for life—and love for yourself. the story: loveswept unfolds as a sensorial love story… opening with a feeling of effervescence from bergamot and blue violet flower, then blooms with the enchantment of a spring bouquet of jasmine, lotus blossom and purple passion fruit, finally, warm musk, creamy amber and white cedarwood linger, creating an unforgettable trail of love ever-after. Through loveswept, philosophy encourages women to follow their hearts every day, in all that they do. its vibrant and romantic scent captures the memorable moments that go along with finding a true love—be it another person, an undiscovered place or a newfound passion. loveswept is a beautiful reminder that love is what compels us to live fully. my review: A very spring-like, fresh fragrance, loveswept made me think of a meadow at dawn… it has a very green scent – green as in fresh, grassy, spring bouquet. I definitely smelled the floral bloom and bergamot, which, by the way, I adore! Just its opening note of bergamot captured my heart, but the fragrance is more complex than that, lingering with its fruity notes and finishing up with a sweet warmth. Definitely a romantic fragrance, definitely something to try on your skin for spring. The loveswept collection is now available at Sephora, and will be available at Hudson’s Bay and Shoppers Drug Mart beginning in April 2014. If you are still searching for a Valentine’s gift for yourself or someone special, treat them (or yourself!) to this gift that’s straight from the heart. philosophy my heart to yours gift set has a scent that is inspired by the sweetest moments in life with a sweet citrus and vanilla fragrance. The gift set includes a 4 oz bottle of combo shampoo/shower gel/bubble bath, a 2 oz body lotion, and a delicious tube of lip shine. This adorable gift set comes in a pretty pink package that I could not wait to open. I was curious about the “sweet citrus and vanilla” fragrance – I don’t think I’ve ever smelled citrus and vanilla together! What a delicious surprise… the fragrance is best described as a sweet cupcake scent (like a sugary vanilla cupcake) with the slightest hint of citrus. I found the citrus element to be very faint, but provide somewhat of a refreshing quality to the overall scent. Very yummy! The lipgloss appears bright pink but applies clear, and has the same delicious scent, without any flavour (which is nice). It’s quite thick and will leave a gorgeous, high shine on your lips without being sticky. The shampoo/shower/bath gel is a nice multi-use product, but I personally am very specific about hair care so loved it as a bath and shower gel. It left behind a nice amount of bubbles in the bath, with the same delicious scent. The scent doesn’t linger strongly on your skin, but you will get that from the body lotion! With the shampoo/shower/bath gel and body lotion available in full size bottles, you can certainly indulge long after this gift set has enveloped you in its sweetness! 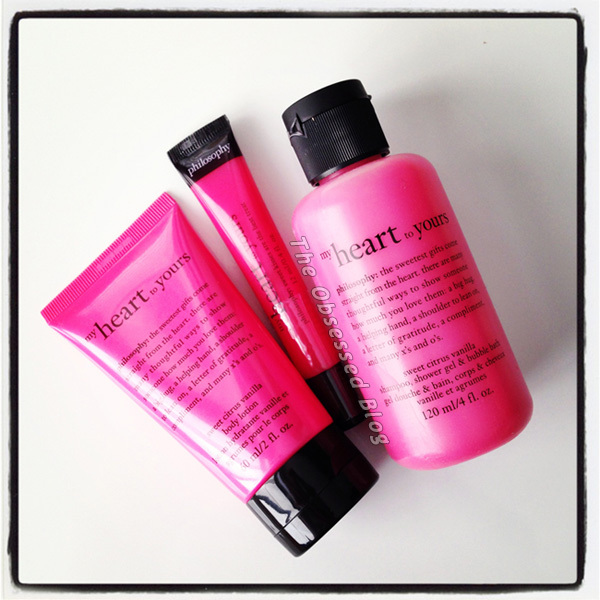 The philosophy my heart to yours gift set, $29, is available at Sephora, The Hudson’s Bay & Shopper’s Drug Mart. Full size philosophy my heart to yours body lotion, 210ml, $21, and shampoo, shower gel & bubble bath, 480ml, $21, available at Sephora & The Hudson’s Bay. For more info, head to philosophy on facebook, twitter, and instagram! Happy Valentine’s Day! If you enjoyed this post, will you take a moment to like it or comment? This contest is not only sweet, but it will sweep you off your feet! 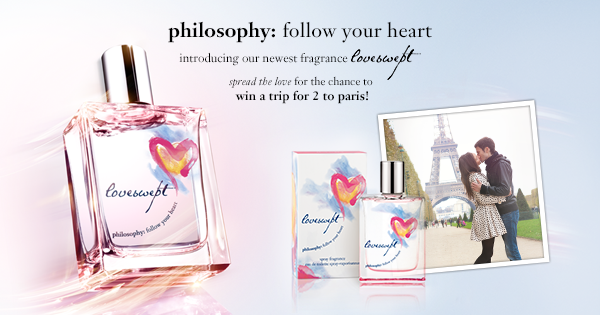 what: the spread the love sweepstakes, in celebration of the launch of philosophy’s newest fragrance, loveswept. philosophy fans are invited to ‘spread the love’ by sending a digital love note tagged #loveswept for a chance to win prizes that will sweep them off their feet. grand prize: a romantic getaway for 2 to paris, courtesy of jetsetter. includes a 4-night stay at the sofitel paris arc de triomphe, 2 airline tickets, airport transfers to and from the hotel and $1,000 to spend. 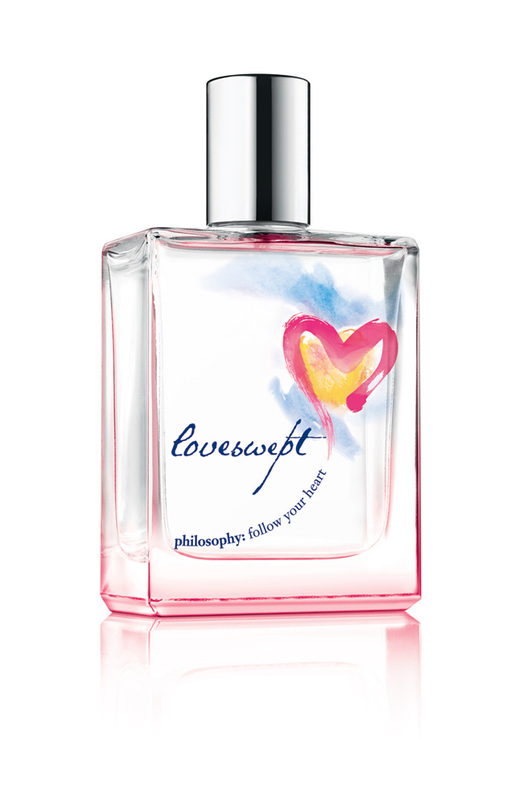 10 runners up will receive a loveswept spray fragrance and 4 award-winning philosophy faves. 20 additional winners will receive a loveswept body lotion. all love notes tagged #loveswept will be automatically entered to win! your heart, you live a life full of passion. *Sweepstakes will be open to residents of the US and Canada, excluding residents of Quebec.